Klein Plating Works offers hydrogen embrittlement relief through metal heat treatment and baking metal parts. Hydrogen can cause damage to steel causing brittleness and loss of ductility. A pre-treatment process can allow for hydrogen to be introduced during the forming, machining, fabrication, and/or welding of a component. One of the most accepted methods to help alleviate hydrogen embrittlement is through baking the parts, preferably immediately, but no later than 3 hours after electroplating. The metal heat treatment process serves to remove or redistribute the hydrogen by allowing it to escape through the micro-porosity in the metal and plated deposit. Klein Plating Works maintains five separate ovens for metal heat treatment and baking metal parts. The ovens’ temperatures have a maximum range of 800 ◦F and are digitally controlled for accuracy. All of Klein Plating's ovens are calibrated on a scheduled basis to ensure dependable daily operation. Affecting deposit properties such as hardness of electroless nickel. We advise all of our customers to indicate to us during the quoting process any requirements for post-plate baking. If it is not on the part drawing or discussed during the quotation process, then hydrogen embrittlement relief baking will assumed to not be needed which could lead to field failures. Contact us for additional information about our metal heat treatment processes. Klein Plating Works, Inc. assumes no liability, nor can we make any promises or guarantees, that your plated and/or baked part(s) will be totally hydrogen-free as a result of any step(s) of the plating and/or baking process. Additionally, Klein Plating Works, Inc. assumes no liability for parts that perhaps should have been hydrogen relief baked, yet were not as a result of the customer’s decision. 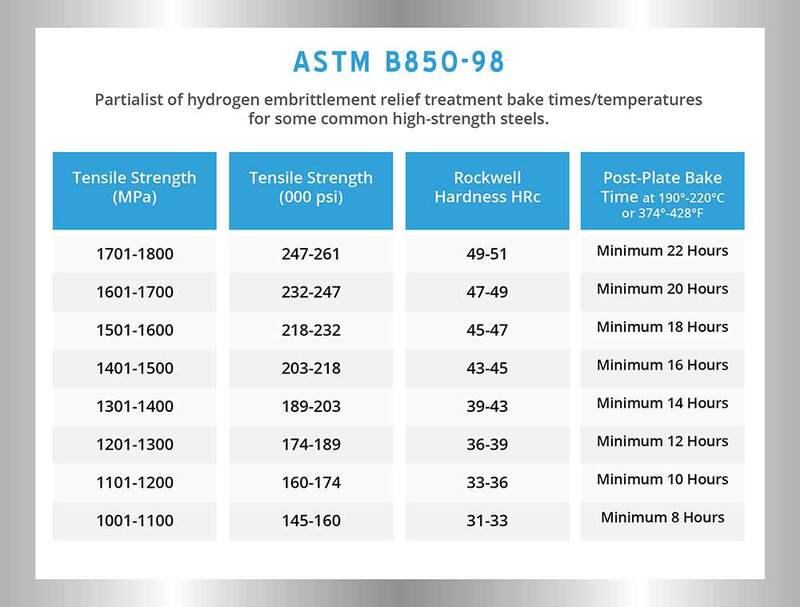 To help reduce the risk of hydrogen embrittlement failures, we strongly suggest that our customers abide by ASTM standard B850-98 (reapproved: 2009), for relief baking times. Any high strength steel having a Rockwell Hardness (HRc) of 31 or higher and/or a tensile strength of 1000 MPa or higher, should be baked between 374º-428ºF. The baking duration should fall between 8 - 22 hours, depending on the actual hardness rating/tensile strength of the steel.